The HAK101 Invincible Tornado Twister RC Car by Haktoys is no ordinary remote controlled car – this is a stunt car through and through! 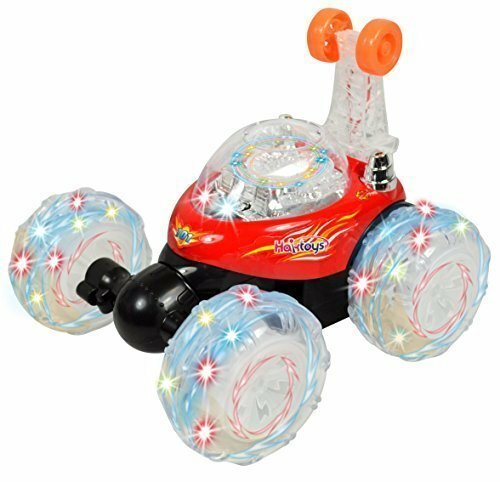 With bright flashing LED lights, the ability to do full 360-degree tumbles and spins, and a rotating front axis, the HAK101 Invincible Tornado is unstoppable, as is the fun you’ll have with it! The light-up LED tyres are visible from a distance, and they’ll need to be with the HAK101 Invincible Tornado 40 foot range. Meanwhile, the oversized racing wheels and top balancing wheel allow the HAK101 Invincible Tornado to complete amazing tricks, wheelies, spins and flips without missing a beat!